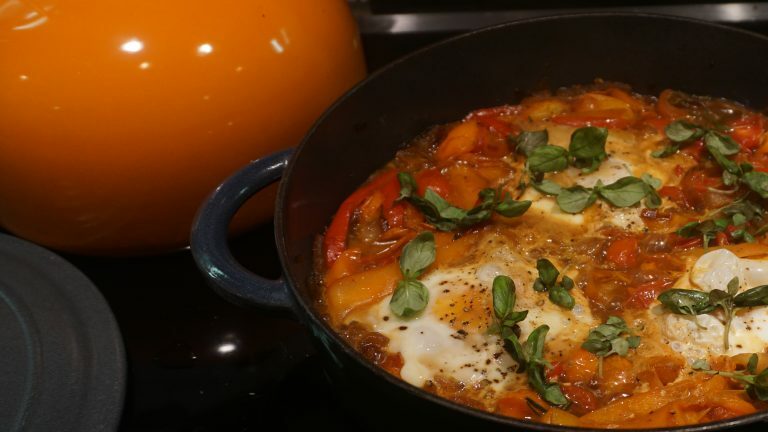 I first came across this recipe in one of my favorite cookbooks, “Plenty” by Yotam Ottolenghi. I loved this recipe at first sight and wanted to make it while on vacation at the beach. My only problem was that I didn’t have everything the original called for. So, being me, I decided to wing it and make up my own version. It turned out fantastic! We gave it a little Italian twist and now, after some polishing, its a solid recipe I make often and wanted to share with you all. The warm weather temps have got me thinking of all the delicious dishes that I can make with beautiful, ripe, farm fresh tomatoes; this dish is definitely one of them. I would serve this as a brunch dish but it could also be a very satisfying dinner alongside a green salad and some whole grain bread. Yum, eat up and enjoy! 1. Heat a 10-inch cast iron skillet over medium heat. 2. Add 1 TBS. 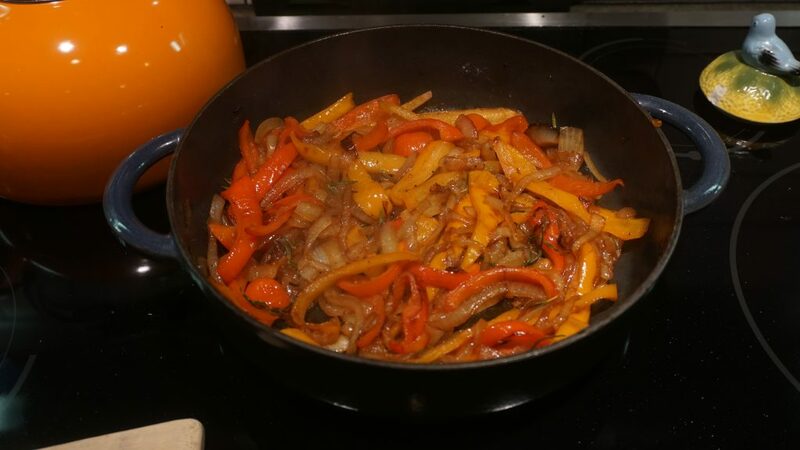 of olive oil and all the sliced peppers and onions and saute for 5-10 minutes or until you get a nice color on them. 3. Add garlic and saute for a minute more. 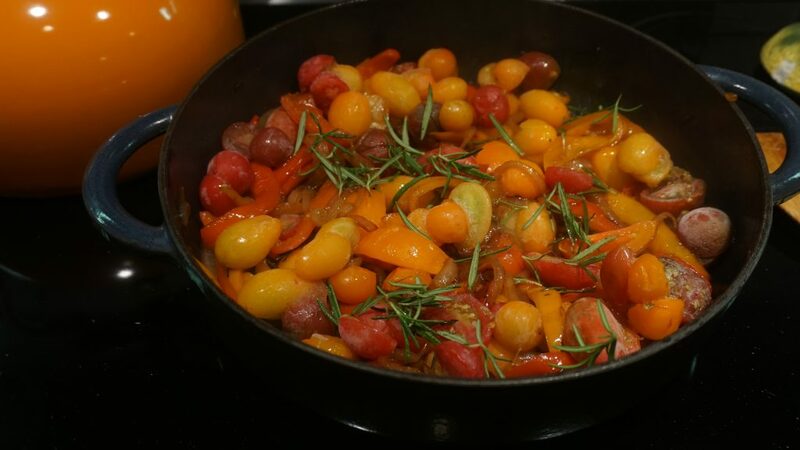 Add tomatoes, rosemary, salt and pepper. 4. Reduce heat to low and cook for 10 more minutes. 5. 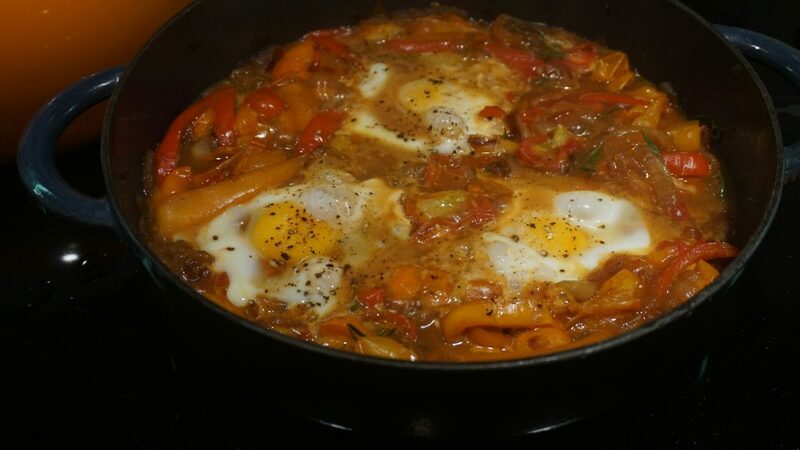 Make 6 gaps in the pepper tomato mixture and carefully break an egg in each gap. 6. Sprinkle eggs with salt and pepper and cover the skillet with a lid. Cook on very gentle heat for 10-12 minutes or until eggs are set. 7. Sprinkle with basil and serve alongside a crusty whole grain bread. Heat a 10-inch cast iron skillet over medium heat. Add 1 TBS. of olive oil and all the sliced peppers and onions and saute for 5-10 minutes or until you get a nice color on them. Add garlic and saute for a minute more. Add tomatoes, rosemary, salt and pepper. Reduce heat to low and cook for 10 more minutes. Make 6 gaps in the pepper tomato mixture and carefully break an egg in each gap. Sprinkle eggs with salt and pepper and cover the skillet with a lid. Cook on very gentle heat for 10-12 minutes or until eggs are set. Sprinkle with basil and serve alongside a crusty whole grain bread.